Inflatable stand-up paddleboards are a relatively new product that offer paddle boarders great versatility. Because they can be stored away easily, it’s simple to take your board where ever you go. Sometimes, iSUPs are a little less stable and solid than a traditional fiberglass board, but that is not the case with the ISLE Touring 12’6”. The ISLE Airtech Touring iSUP is one of the best inflatable boards on the market, and that primarily has to do with the design of the board and the accessories included. This board is great for intermediate riders, and because it is built with touring in mind, or going fast over long distances on relatively calm water, you can expect to ride along with ease. The most significant thing that most knowledgeable riders will notice is the fact that this board is bigger than other iSUPs at 12 feet and 6 inches long. The size gives it stability and the ability to carry multiple riders. The design is also eye-catching because while most inflatable boards have a rounded tip, the ISLE touring has a narrower tip. This feature allows the board to cut through water, even choppier waves and gives it extra speed. There are a ton of other features that push this board to the top of the pack, and this ISLE Touring 12’6” review will go over these awesome additions. ISLE knows what they’re doing when it comes to water sports and have been crafting paddle boards and more for years. They wanted to do something a little different with this iSUP and make it one of the faster and more portable boards on the market. This board is about 30% lighter than most boards out there, and that is due to the Airtech design. The material of the board is a military-grade PVC that gives it durability out on the water. The covering also uses drop-stitch fabric that allows flexibility and movement while keeping the rigidity of the board. The core of the board also has a coating with a special seal and bonding layer that just further reinforces the strength of ISLE Touring 12’6”. 12 feet is longer for most boards, but because this is a touring board meant for faster and longer rides, 12 feet is the perfect length. Experienced riders will enjoy the diamond-groove grip deck that keeps your feet comfortable on longer trips. For other riders that are a little less experienced this groove pattern will also help you stay upright on the board. Finally, the nose and three fins just add to the speed of this already fast board. The narrowed head can cut through water like a knife and will even help you stay stable if the surf gets a little rough. On the underside of the board, there are three fins. The center fin is detachable and can help you navigate in different water settings. The lightweight design also translates to when the board is deflated. Everything easily stores in the carrying bag, which makes the full process of setting up and breaking down your board simple and fast. One of the perks of many inflatable SUP’s is that everything you need to get out on the water comes with the board. The same is true of the ISLE Touring 12’6” plus they also have a few added perks to their board. 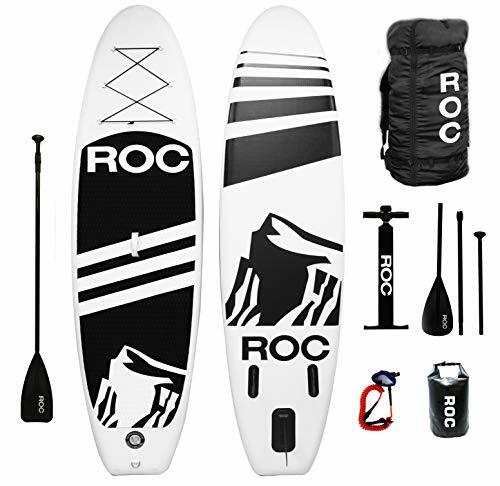 The board comes with an aluminum paddle, repair kit, pump, bungee cords, and a bag to carry everything. The paddle breaks down into three parts, so it is easy to store when you aren’t using it. It is also adjustable which makes it great for taller and shorter riders to find a comfortable length. The pump and repair kit ensure that you have everything to get going as well as patch any holes you might get. The bag easily stores all this equipment, so you have everything in one place. The ISLE Touring 12’6” can hold up to 275 pounds which means you can have a few riders or carry extra cargo. The front of the board has a bungee system that allows you to secure your gear such as backpacks, camera, or a cooler. There are also D-rings along the side that makes it easy to attach other equipment. The board also has a D-ring on the back so you can connect a leash if you have one. The leash makes it easier to keep the board with you if you fall off. The board also had two handles for simple carrying. It has the standard center handle so you can carry your board to and from your car. It also has a handle at the front of the board which makes it simpler to get your board in and out of the water as well as guide it where you want to go. Lightweight – This is one of the lightest boards on the market. It is 30% lighter than other iSUP, and because of its unique Airtech design, it is still strong as well as fast. Fast design – Because this board is narrower at the head, it can really move. Advanced riders that want to cover longer distances can do so with ease on this board. The length also gives it an extra advantage in the speed department as well as makes it a bit more stable if you’re still learning the ropes. Plenty of cargo space – If you use this board for touring and plan to be out on the water all day, you need a place to store your gear. The ISLE Touring offers plenty of room to carry not only you but all your cargo as well. The bungee system will secure most of your gear to the front of the board, and the D-ring system allows you tote extras like a cooler or dry bag. Accessories included – Everything you need to get out on the water is in this kit. 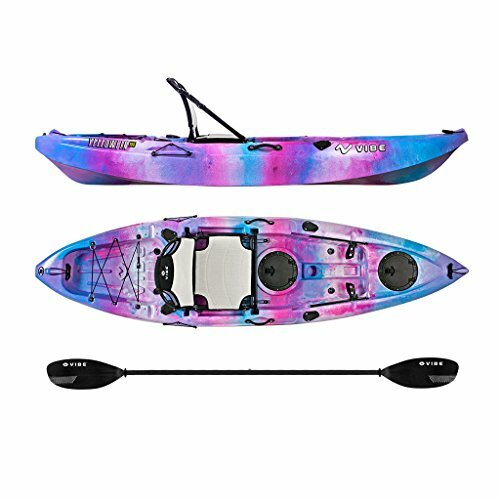 You get the adjustable paddle that can break down for easier storage, repair kit for quick patches, pump, bungee cords, and a backpack to carry everything. 30-day return & 1-year warranty – If you want to return your board for any reason, you can do it for free in the first 30 days, no questions asked. There is also a 1-year warranty that covers all materials and workmanship. Reading all the features and innovations of the ISLE Touring 12’6” is great, but if you’re going to make a big purchase, you want to know what actual customers think of this board. The good news? It has some rave reviews. Experienced riders love the fact that this board performs likea traditional fiberglass paddleboard. Many enjoy that it is a little larger and that their ride is incredibly smooth. A lot of riders take the ISLE board out all day and feel entirely comfortable the entire time. With the ability to carry extra cargo, they also were able to stay out all day without coming back to shore for supplies. The most prominent complaints that users had about ISLE Touring board weren’t about the board itself but the accessories. Most customers had a little trouble using the pump to get the board up to the proper psi, and it took a much longer time to inflate than anticipated. Many said they got a separate electric pump and that took care of the problem. Also, the paddle is made of aluminum and can be a little flimsy. Most users said it worked ok but that a better paddle would help novice riders handle the board even better. Other than those few little problems, most customers only had wonderful things to say about the board itself. Almost all of them loved that it was very easy to store and carry and liked the fact that they could keep it in the car to use whenever they wanted. While the board is on the higher end for price, all customers thought it was worth it for a quality board. Intermediate to advanced riders that use a traditional hard paddle board most of the time but want to transition to an iSUP will enjoy the ISLE Touring 12’6” Inflatable Stand up Paddle Board. Its design is similar to a traditional board with a narrow head and 3-fin system to guide through water quickly and steadily. Unlike traditional boards, it is lightweight but still bigger than some other iSUPs. The Airtech innovations along with high quality PVC material and coated drop-stitch fabric creates a strong and durable board that will last for a long time. The diamond-groove deck just adds further stability and comfort while on long rides. If you want to take this board out on the water all day, you can do so with ease because there are enough spots to tote your cargo. Bungee cords on the top of the board along with D-rings along the sides make it simple to carry everything you need for a day of fun. You can even bring along other people because the board can support up to 275 pounds. Riders who want a reliable iSUP should look no further than this board and hopefully this review of the ISLE Touring 12’6” helped give you the information you need to take the plunge!